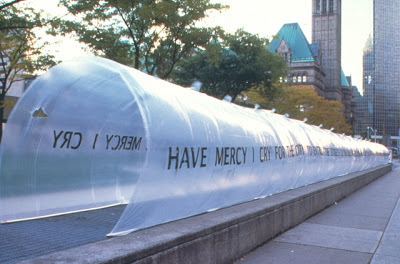 During the Metro Days of Action, 150' long building was inflated using the air vents in front of Toronto’s Nathan Phillips Square. The October Group action references both public institution and temporary home to protest the erosion of the city. The October Group is Adrian Blackwell, Cecelia Chen, Daniel Diaz Arrasco, Kenneth Hayes, Barry Isenor, Mike Lawrence, Christie Pearson, Kika Thorne, Wiebke von Carolsfeld, Derrick Wang. Film: October 25th + 26th, 1996, 8 minutes b/w S8 to Beta video 1996 distributed by Toronto based Vtape or CFMDC and Kino Arsenal in Berlin.